Chris was a nervous wreck as predicted, even after his practice run around the closed track the previous day. Today was when it all counted though, and the weight of his family, his work (JPM Holdings Ltd) and Motor Trucks Distributors Ltd rested on his shoulders to bring home the trophy in our inaugural year at the competition. Driving the new Volvo FH with a 700Hp engine towing a 3 axle curtain-sider semi trailer with a gross weight of 40 ton was a surprise for everyone and a big learning curve for our Asian competitors. Qualifying was held in the morning with 11 competitors from their respective countries competing and the best 3 making it through to the final to be held that afternoon. The track was 4.8km long which accounted for 2 laps around the closed circuit. It included 11 corners and 3 inclines. The time limit was 14 ½ minutes to complete the course otherwise a 1 litre/min over time was the penalty. Chris was happy after his morning drive and seamed relaxed awaiting the results which were announced at 2.30pm that afternoon. Chris’s name was called when the finalists were announced and he was ecstatic with the result. Reaching the final 3 was a huge accomplishment in itself from the thousands of entrants from varying countries that had entered. The other 2 countries to make the final were Australia and Thailand. A curve ball was thrown to the competitors in the final with the track been run in reverse which added 2 compulsory stop signs (one on a hill). Time limit was 15 minutes this time to complete the course. Australia had drawn to go first, followed by Thailand then NZ. Grant the Australian driver (who placed 7th last year in the Australian final) drove very consistent and timed his drive well to finish the course with only 30 seconds remaining on his stop watch. Something he had on the dashboard in the truck (totally within the rules). The driver from Thailand was a little quicker completing the course in 14min. Chris was up next and thinking he needed every advantage he could get choose to drive in socks as this was his normal driving attire. This definitely intrigued the documentary crew that were filming the event. Chris’s time was a quick 13 minutes. Would this be to his detriment or would it prove otherwise. His response to his drive when asked by the attending journalists was that there were 3 things he could have performed better. At the final dinner the results were given and the difference between first and second place was a measly 270ml of diesel. Thailand come in a close 3rd with Australia taking the win and Chris coming a very respectable 2nd position. Although a little disappointed, after some reflection Chris was very happy with his result. For his efforts Chris received a trophy and radio controlled model FH Volvo truck. He was also given a trip to the Global final next year to be held in Sweden. 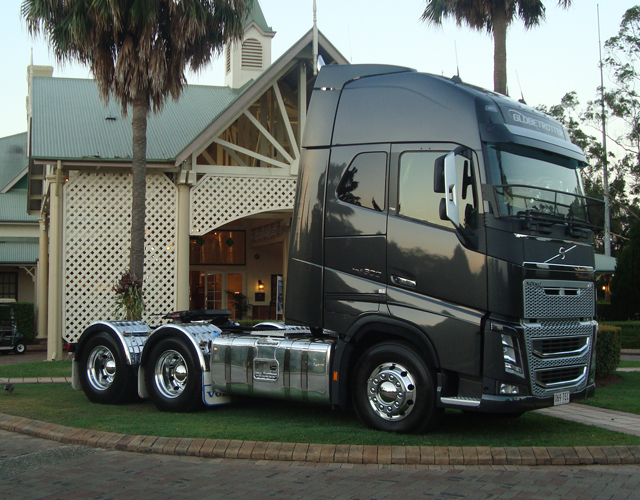 Although he will not be competing it will be a trip of life time to the home of Volvo trucks. A big congratulations to Chris on his amazing effort and great result on his first attempt at this event.